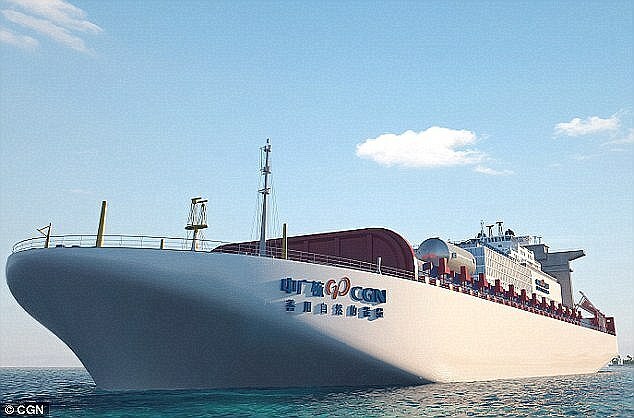 A computer-generated image of China’s planned floating nuclear reactors. A Pentagon report has warned of China’s plans to introduce floating nuclear reactors into the disputed waters of the South China Sea. We first reported on Chinese plans for a fleet of up to 20 floating nuclear reactors in July 2016, and again in August last year. Beijing has made a unilateral claim to more than 80 per cent of the South China Sea, through which about $3.4 trillion worth of global trade passes each year. Five other countries, including the Philippines, also have claims to the strategically crucial and resource-rich waters. In July 2016, the Philippines won an arbitration case at the Hague Tribunal International Court over its territorial rights in the South China Sea. The UN Hague Tribunal issued its decision after several months of hearings and lengthy submission of documentation. China was absent during the proceedings, saying it would “refuse to recognise any negative outcome in the case”. This ruling, which was issued at about the time that President Duterte took office, has been largely ignored by authorities in Manila in favour of better relations with Beijing. Since then, China has continued to reclaim some 3,200 acres of land in the Spratly Island chain and added ports, runways and military infrastructure. The USA, however, continues to challenge Beijing’s claims to the South China Sea — also known as the West Philippine Sea — by staging regular “freedom of navigation operations” in the disputed waters. You erroneously wrote “reclaim” in the next-to-last sentence. “Steal” would be the most accurate word there.